I'm starting to think that Isayama is trying to go for some kind of world record with the number of plot twists in this series. At the risk of repeating myself, this was a hell of a chapter. The implications for the wider story are really interesting, but I do wish that we could take a break from the plot twists for a little bit and deal with what is already happening in the story. That said though, this chapter does clarify the goal of the revolution. Finally. Took them long enough. 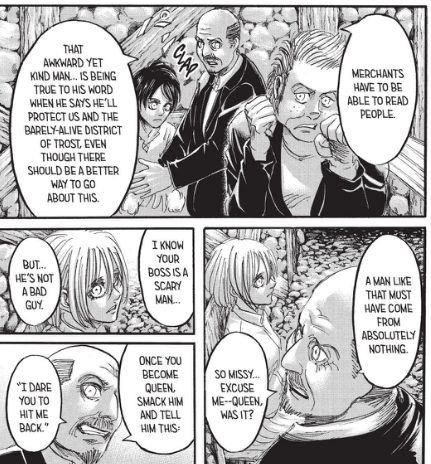 In retrospect it was obviously because of the build-up to reveal Historia as royalty, but as usual Isayama kind of trips over himself narratively in how he decides to present all the relevant information. Anyway, I'm glad that one of the things that's been bugging me for the past few chapters is finally all out in the open. Their current plan and the overall goal of the revolution is to ferret out Historia's father and hear the reasoning behind all of the government conspiracy stuff covered in the last chapter. 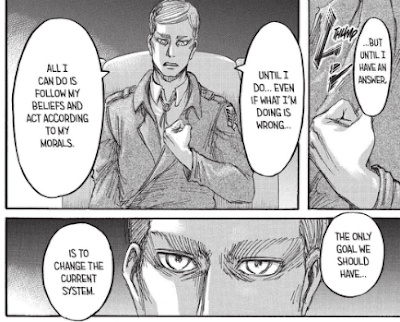 Erwin believes that this could go one of two ways. The first would be ideal for the Scouting Legion, which would result in a bloodless transfer of power to Historia as the new Queen, leaving the way clear for them to go patch the hole in Wall Maria. The other possibility would be if Reiss' reasoning is sound (unlikely), which would result in all the character's deaths for treason. However, this chapter makes it obvious that what will actually happen will be an unforeseen third possibility. As we all know by this point, whenever a well thought out plan is put into action in Attack on Titan, things are about to go horribly wrong. But we'll get to that a little later. 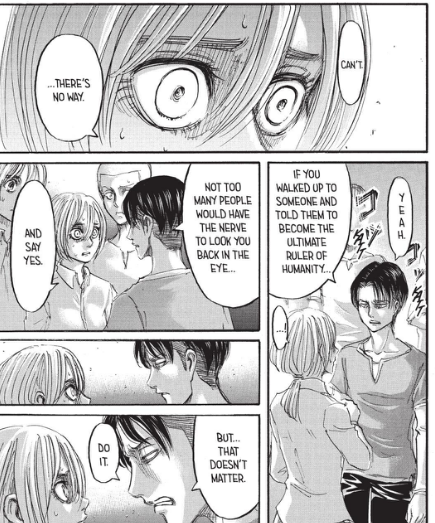 There were two things in the chapter that caused the manga-reading side of the Attack on Titan fanbase to collapse in on itself for a few days (I'm now convinced that the Tumblr fanbase will spontaneously combust at some point before this series is over), and the first was Levi's perceived manhandling of Historia. Before I get into this, I'd like to say up front that I am not condoning his actions. He screwed up. He forgot to let them in on what is arguably the biggest part of the plan and then mistreated Historia for having a natural reaction. There were other, much calmer ways to go about this, but Levi did not chose to go that route. However, much of the complaining that I see surrounding this scene ignores the worldbuilding and the characterization that Attack on Titan has set up so far in favor of painting it as a black-and-white "scary man takes advantage of innocent girl." That is far from what is happening here. As I've said in my last few chapter posts, for some reason people seem to forget that they may be kids, but they are also soldiers. They have given their lives in service to a cause. They have seen some screwed up stuff but still fought their way through it. They do not need to be coddled, and that goes for Historia as well. She is a soldier that was given a direct command by her superior, and she refused to do it. It's easy to read this scene as a response to insubordination. This isn't any worse that what they were put through in basic training--remember Connie being lifted off the ground by his head? Or does that not count because it was perceived as "funny"? Stepping away from the violence of the act for a second, what was Levi supposed to do? Say, "okay, never mind" and let the plan fall apart? Unfortunately, they do not have the time to let Historia get used to the idea of being royalty. Everything has to go correctly, or they will all go down. Accommodating one person's hesitation could get them killed. Levi gives Historia two options. She can go along with the plan, or she can fight him. "Fight against your fate" has been a huge theme in Attack on Titan, and here we're seeing yet another version of it. 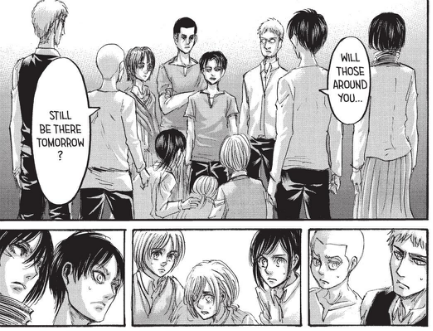 Look at Historia's eyes in the panel above. She does have some fight left in her (refer to what I said above about her not needing to be coddled), yet for the last few chapters she's been lacking in any ambition. I thought that this was strange--you'd think that she'd be raring to go find Ymir--but the additional pages released recently shed a bit more light on that. Historia has made leaps and bounds in defining herself, yet despite taking her real name she's still relying on other people to tell her who she really is. Without Ymir around, there's no one to remind her that she doesn't have to play a role if she doesn't want to. We see it in this scene. She doesn't fight back and decides to accept the "role" as Queen. Historia still doesn't have the internal strength or sense of self outside of what people want her to be. 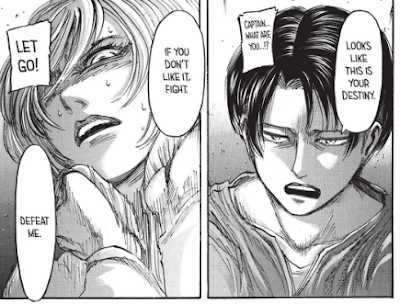 Maybe the failings in the plan will give her another chance to fight back, but for now Historia isn't that much different from Krista. 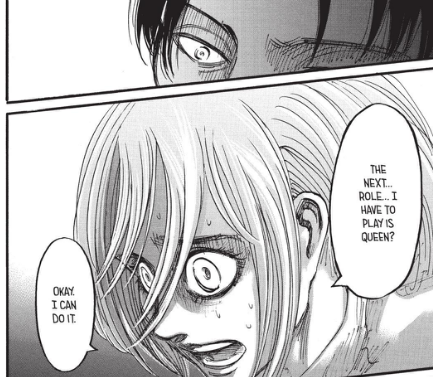 Speaking of roles to play, Levi gives some very interesting insights into his character in this scene as well. He calls everyone out on being complacent. Their enemy might have changed for the time being, but they're still at war with the Titans. Everything could go wrong at any time, which we've already seen happen several times in this series. 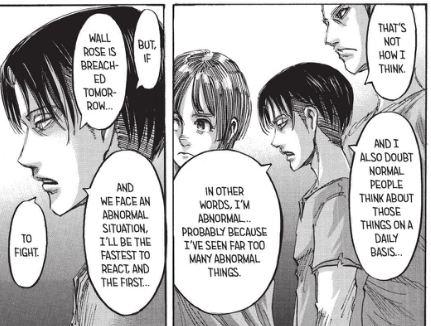 The panel on the (right) is particularly telling; Levi lives every day expecting the absolute worst. Can we even say that about most of the characters in that room? When I talked about last month's chapter, I mentioned one of the bigger questions of the series: "Would you be willing to sacrifice your humanity to save the world?" Levi has his answer. He'll do anything, literally anything, if it contributes to what he believes is the greater good. He does not care if one kid gets rattled a bit if it means that humanity as a whole is getting closer to an end to the war. The panel referencing last chapter's torture scene is key here. He may not like what he's doing, but he's accepted that role and what it entails. Hanji is going through a similar internal conflict right now as well. Despite getting revenge for Pastor Nick, there's no proof that what Hanji did actually changed anything. 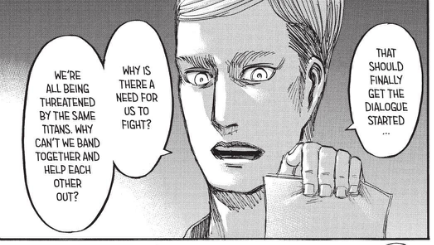 I think that was the basis behind his challenge to Historia to run away or fight him. 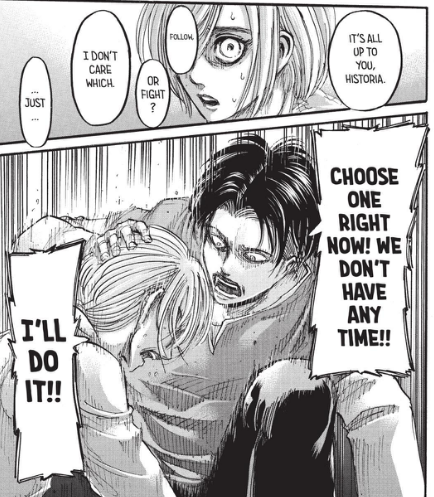 Neither of them has the luxury to say no to the roles they've been given in this situation, and if Historia wants to go against it, she needs to have the strength to back it up. And as I said above, she doesn't have that right now. Again, does that excuse his actions? Hell no. But Levi has always been characterized as someone who will use any means necessary to get the outcome that he wants. If you've been reading for this long, this shouldn't be that surprising. As for some of the people claiming that they're not upset at this scene because of gender, I didn't see many of you complaining when Levi beat the living crap out of Eren in the courtroom scene. And this is just a personal opinion, but if you're the kind of person who completely loses their mind over a fictional character being mistreated without even attempting to consider if it makes sense within the larger work, Attack on Titan might not be the series for you. And moving right along to the other moment that caused certain parts of Tumblr to freak out, it looks like we've finally got a last name for Levi. I don't think anybody guessed that it would be "Ackerman" though. My first reaction was "Hey, cool, he's related to Mikasa," but after seeing a bunch of wild fan theories relating to the "clan" Mikasa's mom mentioned, once again I'd like to remind certain parts of the fandom to take a deep breath and remember how western naming conventions work. First of all, "Ackerman" would be the family name from Mikasa's father's side--we have no idea what her mother's clan name is. Also, I'm not a linguist, but "Ackerman" doesn't sound remotely Asian to me. If Levi and Mikasa are related, it would be through her father, not her mother. 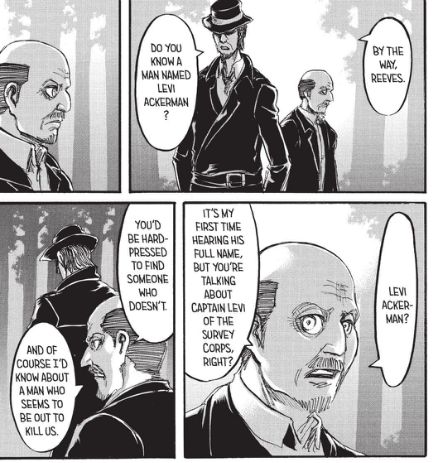 Secondly, all of us are assuming a lot about Levi's relationship with this man from the above exchange, since that and another character calling the guy "Captain Ackerman" are all we have to go off of right now. It's possible that they're not biologically related at all. 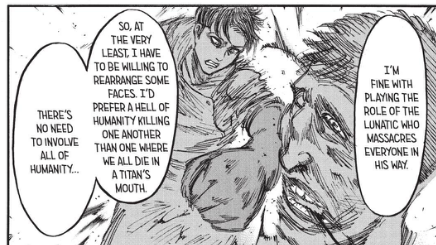 The way he talked about Levi wasn't like how a parent would mention their child. 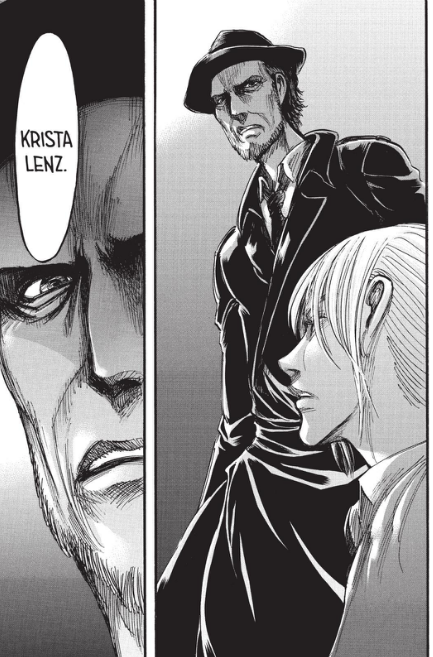 Despite all the inconsistency in Isayama's artwork, he has made it a point to make the children look like their parents when they do appear in the manga so that the family resemblance is obvious. 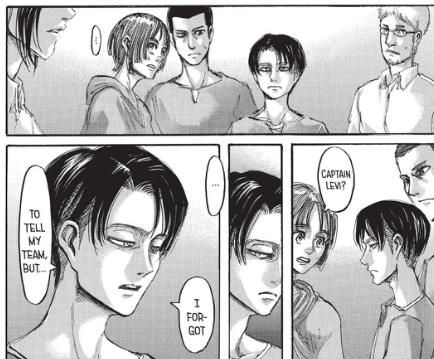 I did not make that connection between Captain Ackerman and Levi (although admittedly, there's something similar in their expressions). To me, it sounded like they had a student-teacher kind of relationship. He also didn't act like he was looking for a legitimate answer from Reeves. It seemed more like he was talking out loud to whoever might be watching. If he taught Levi "everything he knows," then he likely recognized his handiwork. He could tell it was a trap. I don't think that he realized that the entire thing was staged, but the Scouting Legion wasn't counting on him seeing through most of the trap either. Hopefully this means that we'll be getting into Levi's backstory soon the way that we did with Erwin. The prequel manga--which the English localization is calling No Regrets--is enjoyable, but doesn't actually get into Levi's head in the way one would expect a prequel to do. He's the perfect soldier with little effort, with no insight into his personality. There's a very obvious gap of information from before he ended up in the underground, and that's where I think Captain Ackerman comes in. For whatever reason, Levi ditched his name and ran away. For a character as die-hard loyal as he is, that's a pretty big deal. Barring the possibility of more out-of-left field plot twists (of course we can't find out what Eren remembered, that would be logical writing!) this will probably be clarified soon, since Captain Ackerman has easily taken the place of the Military Police as the Scouting Legion's foremost threat. Right now I'm more interested in what role Mikasa's family might have in all of this, which brings up some potential disturbing implications. What was her father's connection to this guy, if he had one? This is just speculation on my part, but maybe the attack by the child slavers wasn't as random as we were led to believe. They did mention that they only needed to kill Mikasa's father... But following potential foreshadowing in this series is like falling down a rabbit hole, so I'll just stop there. Random shirtless Erwin to break up the tension. 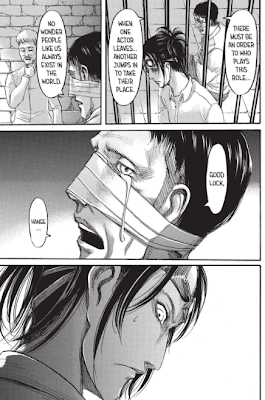 Thanks, Isayama! Surely, this has to be enough for the plot to deal with now, right? 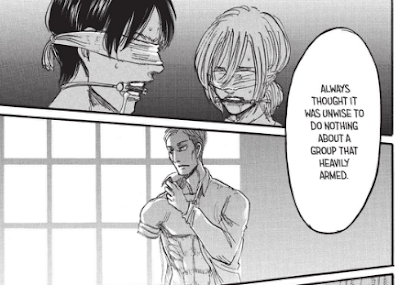 The plan has gone wrong, Historia and Eren have been kidnapped (again), other translations reference something called an "anti-3DMG device," and slitting throats is apparently Captain Ackerman's hobby. Not to mention that Hanji and whoever went with them (hopefully someone did) have no clue that that things aren't working out. The last time things went south, Erwin lost an arm and Hannes died, so I'm bracing myself for the inevitable downswing in this arc. I just hope that I won't need tissues. Hey hey ! dont understimate the scouting legion!! some theories say that captain ackerman is the GORILLA TITAN !! you know they kinda look like , the beard , the expression and their interest in the 3dmg . I can see where people are going with that theory, but it has one major hole in it--when Mike fought the Ape Titan, it showed interest in the 3DMG because it had no clue what it was. 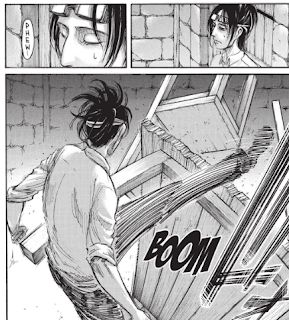 We see Ackerman working with the Military Police when he killed Historia's mom years ago, so it would be impossible for him to not know how 3DMG works. ...There's also the stuff that was revealed in the recent Chapter 57 raws, but I'll hold off on spoilers until the official translations are released. Basically, it's a cool theory but it doesn't hold up against what we've seen so far. Chapter 57, just solidified my theory. Will you be making a review on this month chapter? Yes. I'm planning to have it out within a week after the official translations are available. Good review. I think Hanji or Erwin will die.